It was always Marty Mateer’s passion to become a Feeder Driver with UPS. While all UPS members’ paths to this position mean incredible dedication and hard work, Mateer’s took an extra turn when he heroically saved the life of a fellow driver. 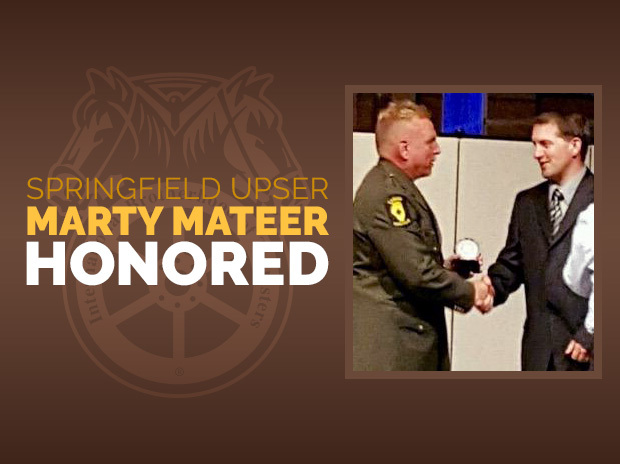 Mateer began his Teamster career in 1998 at the UPS Springfield barn as a Reload Part-Timer. He moved up through the ranks as an Air Driver, Vacation Driver and Package Car Driver, and he was finally told that a feeder position was available in 2015. On April 22, 2015, Mateer was on the final step in his feeder training: a mentor ride with 20-year safe driver Doug Sutton. On that fateful run, Mateer’s instincts kicked in to ultimately save Sutton’s life. Unbeknownst to anyone, Sutton had a medical condition that caused him to leave the roadway where their truck turned over and burst into flames. With the help of a Good Samaritan, Mateer was able to pull Sutton from the truck’s cab to safety. Minutes later, the truck was fully engulfed in flames. I truly believe that God put in in that cab that night to save Doug’s life. Through that experience, I have made a lifelong friend, and it has made me a better driver to this day. I’m excited to see what my future at UPS will bring, and I would like to thank Del Schaefer and Ron Dillon for showing their support. Mateer was honored at the Illinois State Police Department Awards Ceremony on May 18, 2017 as one of three individuals to receive the Director’s Award of Distinction. This award is presented to those who are not officers but still go above and beyond to help in their communities. Marty clearly has the instincts to be a great driver, and those are things that can’t be taught. We’re all extremely impressed by his courageous actions and proud to stand alongside him as Local 710 members.